Austin Cluetivity combines the best elements of a classic treasure hunt, GPS-Geocaching and Live-Escape-Games with Augmented Reality Technology into a new INDOOR team game. The basic game-play is simple: Use your iPad to analyze a virtual crime scene where you will use a chalked outline symbol of a body to see Einstein’s crime scene. The object is to guess from a list of options how Einstein died based upon the clues given in the game. In addition, play an AR game to unlock a magical chest by solving complex elements that will get an octopus to let go of the latches that are holding the chest closed. Austin Cluetivity mini-games begin with a game orientation at one of several starting locations around the city. Groups are organized in teams of up to six players. 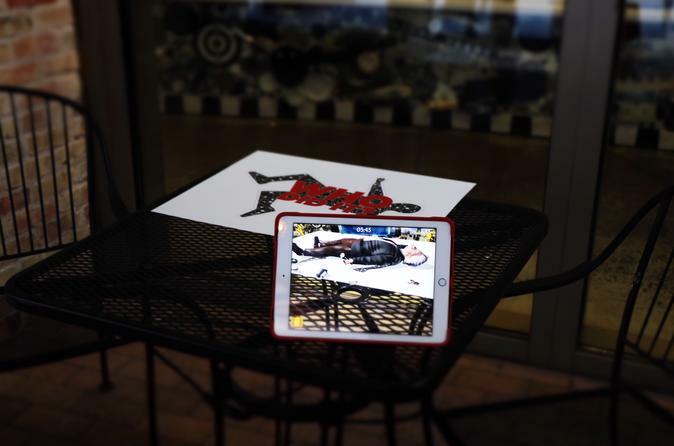 Each game gives teams up to 10 minutes to explore the Augmented Reality world to guess a correct answer. Enjoy analyzing the crime scene in a murder mystery game, "How did Einstein die"? When you finish, you may play another indoor mini-game that will challenge your team to unlock a treasure chest that is being held closed by an octopus. These mini-games are fun for the whole family and gives everyone a chance to contribute to the challenge.